According to Fable 3's art director, work on the game is progressing significantly faster than its predecessor, despite it being much larger. The first time you do something is always the hardest, and that doesn't matter if you're trying to bake a cake, put up a shelf, or make an Xbox 360 game. But according to John McCormack, Fable 3's art director, that previous experience - and the resources that came from it - mean that work on this latest Fable is moving much, much quicker than the last one. 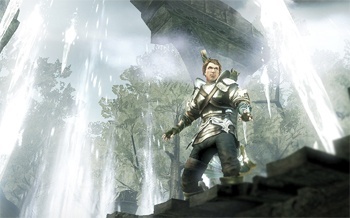 McCormack said that having the engine already built made it much easier to develop Fable 3. He said that while Fable 3 is a much bigger game than Fable 2 - both in terms of size and the variety of content - it was much easier to iterate this time round, and work was moving ten times faster than the last game. Working on Fable 2 had been "scary," he said, as it was hard to tell how things would hang together when they were finished, and were effectively working in the dark. But he said that this time around, there was a much more relaxed atmosphere, as the team had lots of experience and were excited about the project. It's taken Lionhead just two years to create Fable 3, so while "ten times faster" is probably at least a little bit of an exaggeration, it's clear that things are moving pretty quickly. Fable 3 will be available on Xbox 360 on October 26th, with a PC version to follow.